Enjoy the privacy of Lucy’s 22 Acre Wood, just 5 minutes walk from the cottage, with its tranquil Barn and Labyrinth and the BBQ area. 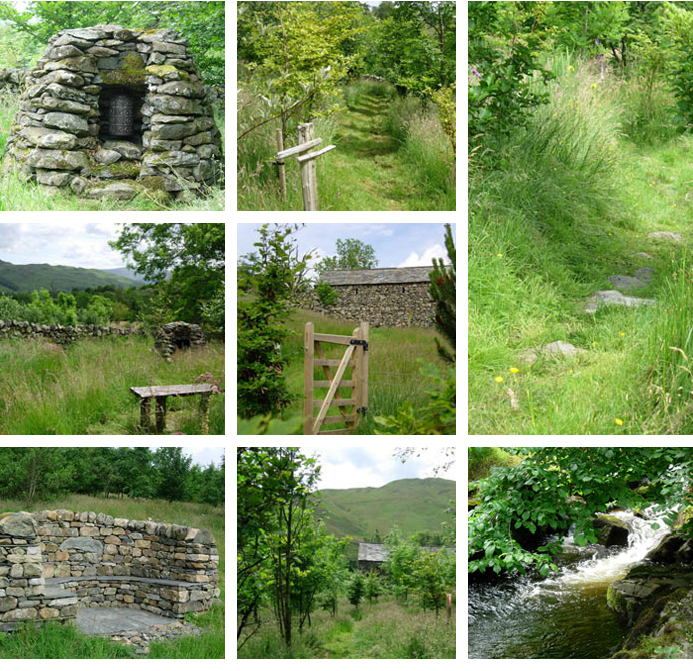 Our stone horseshoe seat built high up in the woodland area has spectacular views over the Ullswater fells, the Aira Beck and water falls, woodland paths with 15 seats leading to the Aira Beck, and the Spiral path. 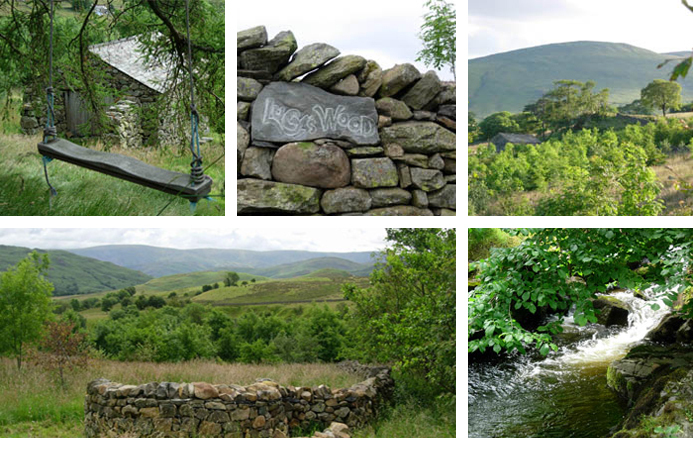 Enjoy a pool in the Aira Beck deep enough for wild swimming and an evening star gazing beside a blazing warming Chimenia. 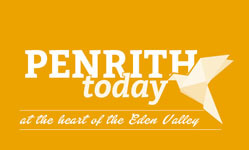 Press: Read our article in tis month's Penrith Today. 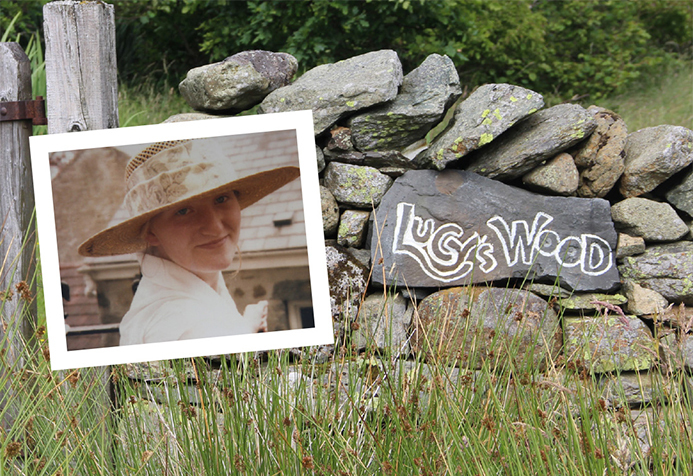 Whilst there are many ways to find peace and tranquility, only those who have been particularly fortunate have discovered Lucy’s Wood in Matterdale. Some people chance upon it when walking near Aira Beck. Others have attended concerts in Lucy’s Barn. I was privileged to be guided by Lucy’s father, Richard Farncombe. 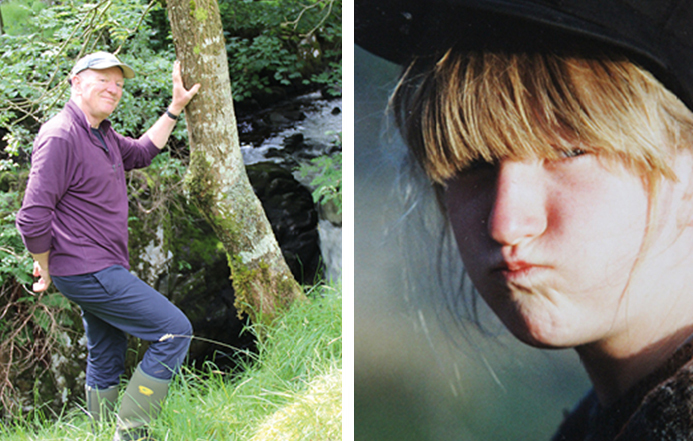 When Lucy Farncombe died in 1996, age 17, she asked her parents to plant a woodland in her memory. 21 years later, visitors can explore a maze of paths through maturing deciduous trees, be surprised by quirky carvings and thought-provoking inscriptions, enjoy the all-pervasive chuckle of water, catch glimpses of wildlife and be enchanted by birdsong. It is a place to treasure, not just because of its association with Lucy, but because of the value it has added to the landscape. Otters and roe deer have been seen passing through the plant-rich habitat, where snipe, woodcock, toads and dragonflies have all found their niche. Richard confirmed my own impressions. Although Lucy’s Wood will always be associated with the death of his daughter, it is not a melancholy place. Indeed, the converse is true, and the contrast with the wet fellside on which it was created could not be happier. 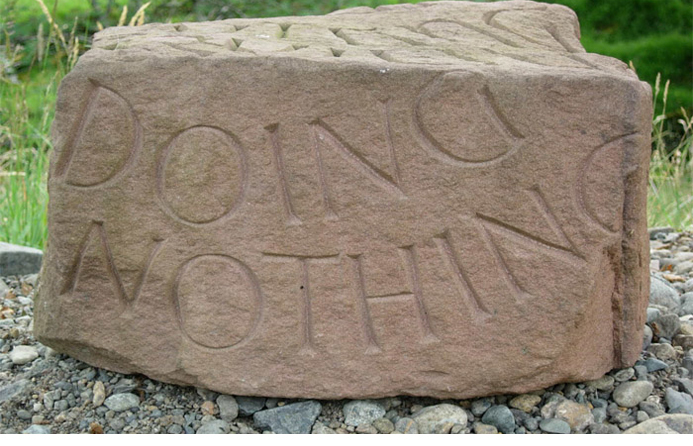 It has taken on a momentum and life of its own. The woodland is a jewel set in history. It lies within a cultural landscape, overlooked by terraces high on the nearby fellside where potatoes were grown during the last war, and it has an intimate history of its own. Different successions of plants and animals have moved in over time. Penetrating Richard Farncombe’s history is a bit like exploring Lucy’s Wood. It is full of surprises. From his early working origins in a glass factory in the West Midlands, Richard became a director of an innovative outdoor equipment company, Survival Aids, in Morland. Eight years later he and his wife, Gina, established Lakeland Romany Caravans, to enable visitors to take holidays in the slow lane, using Romany caravans built by Richard, painted by Gina and drawn by horses. Their holiday business even featured on ‘Blind Date’, hosted by Cilla Black. Richard and Gina’s career paths changed with the death of Lucy. Richard trained to be an orthopaedic remedial masseur and Gina has become a professional artist. I get the impression that Richard rarely sits still for long. Whilst he gave up full time employment last year, he still practices one day per week, and has filled the new-found space with a mix of paragliding, which gives a different perspective on the landscape, and bereavement counselling. Richard derives considerable pleasure from being a volunteer for Cruse Bereavement Care, a national charity that offers support, advice and information to young people and adults when someone dies. I concluded that although Lucy’s Wood was inspired by Lucy, it has a much broader purpose. 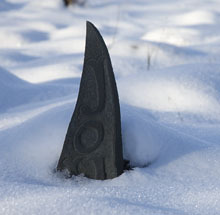 It is a harmonious place, where tranquility and wildlife flourish side by side. As such, it is a model that Richard would love dearly seen applied to the wider world in which we live. Lucy's wood Tread lightly, take memories and leave goodwill. 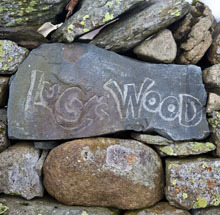 You will find Lucy’s Wood on the 1:25,000 Ordnance Survey at grid reference NY 3832 2180, alongside the headwaters of Aira Beck. Look at our other property which sleeps 4 people, click here for more infomation. "L's right - it was hard to leave and a joy to return to. We hope to do that again soon." "I have thoroughly enjoyed my stay at Crookwath: it is a beautiful place. Lucy's Wood and barn, the pool and the swing, are fantastic touches which we have enjoyed using." Walking quietly through Lucy's wood might reward you with glimpses of the local roe deer residents, red squirrels, and teeming bird life. 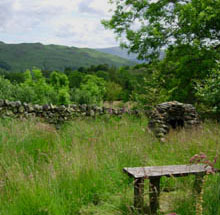 Numerous well placed benches near water or good views allow pause for thought, and to take in the views over High Street and the Helvellyn range. We have recently added a Chimenea at the stone seat, excellent heat source for night time star gazers.